It has 11-FREE system — Free of Paraben, Phenoxyethanol, Sorbic Acid, Benzyl Alcohol, Talc, Imidazolidinyl Urea, Benzophenone-3, Benzoic Acid, Artificial Fragrance, Artificial Coloring and one more (P.S: I don't know the name of the last one). It comes in a compact plastic bottle with a screw-off cap. 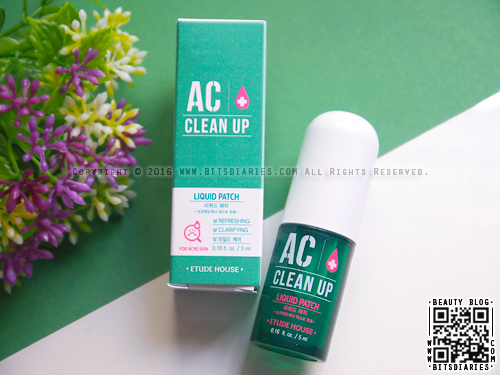 It has a built-in applicator for easy application. 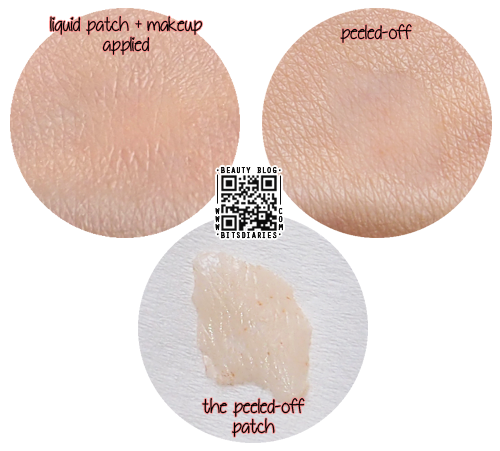 The liquid patch smells like a blend of menthol and tea tree oil. 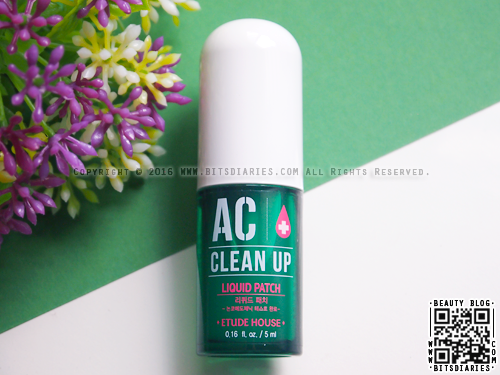 It has a gluey gel-like texture at first but when it dries, it turns non-sticky with a sheen finish. It takes a few minutes to fully dry, depending on how thick you apply. Basically, this is kinda like Nexcare Acne Patch, but it does not absorb pus. It only acts as a thinner protective film on pimples and is designed to be used under makeup. 1. 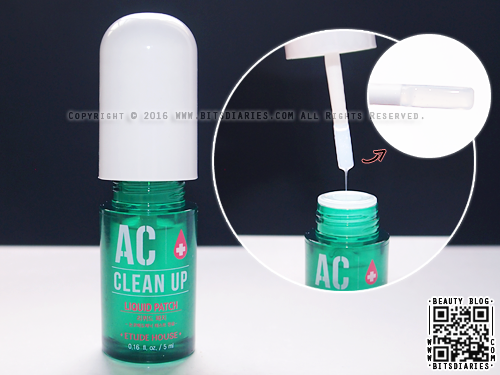 Clean up skin areas with problems and thinly apply an appropriate amount with the applicator. 2. Apply makeup after the protective film is completely dry. I applied liquid patch on my skin, then covered it up with some bb cream and concealer. I noticed makeup can look cakey, patchy and unnatural in the area where the patch was applied. In order to tell if it shields the skin, I peeled the liquid patch off. In the "peeled-off" picture, you can clearly tell that it does what it promises. So yes, the patch shields the skin well. However, I noticed the edges tend to loosen up easily when I move my facial muscles (e.g. talking, smiling, eating...). I was told to apply 3 layers to avoid this problem. I tried it, but it still didn't work. Apart from that, it's also not resistant to sweat and oil. So if you have very oily skin and/or live in hot and humid areas, it will not stick well on your skin and will fall off throughout the day. These are the biggest drawbacks of this product. Overall, it works as a protective layer on the skin/pimples, but it doesn't adhere firmly on the skin all day. So I wouldn't recommend using it under makeup. I'm sorry to say this, but I think it's a pretty useless product. I don't recommend buying it at all. I would suggest using it not under makeup, but as an overnight patch. So no dirt from your pillow or whatever gets on your acne.